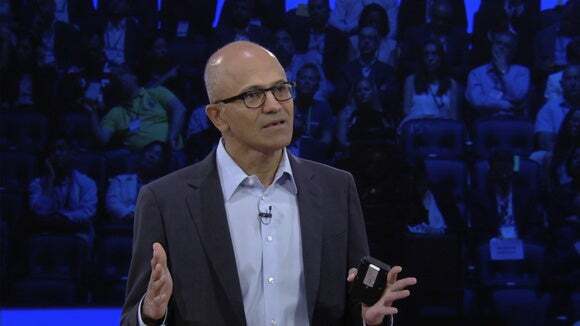 ORLANDO, Fla. -- Microsoft CEO Satya Nadella faced sharp questions from Gartner analysts Tuesday about the privacy-invading implications of its $26.2 billion acquisition of LinkedIn, and its all-knowing virtual assistant, Cortana. Helen Huntley, one of the Gartner analysts questioning Nadella at a conference here, was particularly pointed about the fears. Cortana, said Huntley, "knows everything about me when I'm working. She knows what files I'm looking at, she knows what I'm downloading, she knows when I'm working, when I'm not working," she said. Cortana is "big brother intersected ... with productivity," said Huntley. Nadella countered this with his own question. "How does one build trust in technology?" He called it one of the "most pressing issues of our time." Cortana will operate on "four pillars," which include keeping data secure, as well transparency, meaning that users will "know exact what Cortana knows," said Nadella. There is also an ability to turn off data access. The fourth pillar is to be compliant with regulations, he said. Nadella was appearing via video link from Microsoft's Redmond headquarters at the Gartner Symposium/ITxpo before a crowd that includes 8,000 attendees. He was scheduled to appear in person, but a back injury kept him from flying. "When you turn 49 don't act 19 in the gym," said Nadella, to the chuckles of an audience of people mostly in their middle years as well. With LinkedIn, Huntley, who was asking questions in tandem with fellow analyst Chris Howard, was pointed once again: "What are you going to do to our data?" "We are just custodians of that data," said Nadella. The only data the company has access to is when users allow it for the purpose of adding value to it, he said. For instance, Nadella said, that someone can be much more informed about who they are meeting with if their calendar includes LinkedIn profile links of meeting attendees. A user's news feed can also be shaped to include information about meeting participants. "Those are natural points of integration," he said. This ability to integrate with LinkedIn, said Nadella, "will not be exclusive of Microsoft but available to everyone." Allowing integration will help make LinkedIn grow, he said. Nadella defended Microsoft as an open company. "Windows is the most open platform there is," he said. But asked how Microsoft will work with competitors on platforms including Azure, Nadella turned philosophical. That knowledge "comes maybe with middle age" -- a point at which one becomes "comfortable with what I would say are complex relationships." A gentle laugh rolled through the audience. Nadella, in response to questions about how A.I. will interact with users, talked about Microsoft's pursuit of A.I. but not the specifics. "There is still a dark side," said Howard, of A.I. ; "there is a risk of an over-mediated life." But, as he did with privacy, Nadella worked to calm concerns and said A.I. will augment human capability, not replace it. "It looks like that they have a vision for the future," said one attendee, Steve Edmonson, a CIO with Chicago governmental organization he didn't want identified. But with respect to A.I., Nadella didn't talk about "where that is really headed."